The beginnings of this work are quite a tease of what it might have been had Austen finished it. In my copy published by the Penguin English Library there is a note from the second edition of the Memoir, 1871 that goes on to explain what Jane Austen’s sister Cassandra shared of what Jane had planned for the story. I so wish she had been able to make it so. 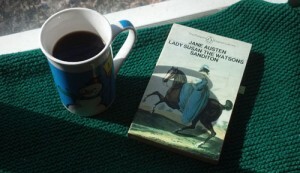 Austen had a special way of getting her heroines to their happy ending without making it feel forced or unbelievable. As it is I must settle for a version ambitiously completed by another author. There are some wonderful Austenesque authors out there. Some I am aware of and others yet to be discovered. So I put it to you, my fellow Janites, which version would you recommend? or some other version I have yet to discover? I am inclined to read the Joan Aiken completed version as I am familiar with her Austenesque work such as Mansfield Park Revisited. However, I would like to hear from you who might have read it or any of the others. I could read through reviews, but what would you say recommends one version over another?